Music is therapy, we all agree. And a classic breakup album proves to be as therapeutic for the songwriter as it is for the listener. In most cases, the cathartic release that an artist undergoes to even begin creating a work of art like a ten-track album commemorating a painful breakup is more transformative than is imaginable. Many artists, it seems, create their best work following the ending of a relationship. 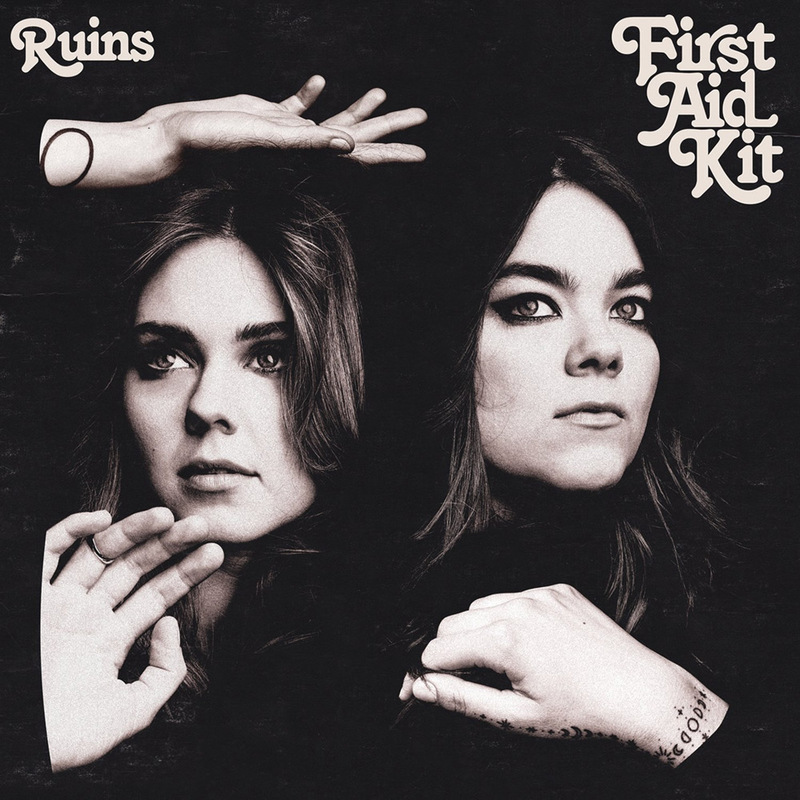 Which brings me to the sisters Klara and Johanna Soderberg, better known as First Aid Kit, who have just released their heartbreak-themed fourth album, “Ruins”. True to their signature heartland Americana sound, the girls reflect on life’s woes with deeply longing lyrics delivered by remarkably raw, haunting harmonies and a poignant truthfulness that is so real it grips at times. As songwriters, their music evokes a quality that is incredibly vulnerable and angst-driven. One half of the Swedish duo, Johanna, phrased their model exactly as “three chords and the truth”. There is a refreshing pain in the music that is so emotionally intuitive. You literally hear the rough and tough moments of life that everyone navigates at some point or another embedded in the fabric of a First Aid Kit song. Since the debut of their early works a decade ago, they’ve gravitated towards storytelling and drawing on an inner connection with their audience. They call themselves First Aid Kit because they wanted to be of healing emotional support by creating music that makes the listener feel less alone in the world. Even when they were just emerging as internet sensations, they had the vision of giving back to the world what their most favorite, touching songs have given to them. Following the success of their critically acclaimed third album, “Stay Gold”, Klara and Johanna took more than a year off from touring to get back to living their private, everyday lives. For a while it seemed that the crazy and unhealthy circus of industry life and pressures of traveling on tour had taken its toll on the sisters, so they took a good portion of time to themselves to do their own thing. Stepping away from each other, as well as their father Benkt Soderberg who produces for and tours with them, took the pressure off of feeling like the act First Aid Kit at all times. They had downtime to live and experience what simple pleasures life has to offer. The sisters agreed that they would schedule an extended stay in Los Angeles to write the new album, whatever may come of it, before heading to Portland to record what they wrote. But then Klara’s heartbreak happened just before their writing session trip to LA, which tipped the creative domino for the theme of the songs on “Ruins”. The album opens with “Rebel Heart” as Klara’s heavy-laden alto sets the tone for the heartbreak album, topped by Johanna’s complementary soprano. The song begins with one vibe but shifts gears with compelling drive due to the band’s live instrumentation creating a wonderful soundscape. The video for the first single, “It’s A Shame”, is the first real representation of the sisters’ individual personalities given the nature of being a duo, which is nice to see. “Postcard” carries an Emmylou Harris, Dolly Parton swag as the first of two country songs of the album. “To Live a Life” includes very simple and revealing lyrics in a sweet lullaby melody over the guitar intro as the song builds on the confession of loneliness and regret. “My Wild Sweet Love” questions all of the intimate details one must question over love lost. “Distant Star” is another country-twinged melodious goodbye tune with a bit more edge that picks up momentum with grit and anger. The latter additions to the album, “Ruins” and “Nothing Has To Be True”, feel a bit too angsty and tortured, but “Hem Of Her Dress” is the closure (or the hope thereof) that is necessary to finally move on in life. What’s missing from the album is the 2017 single “You Are The Problem Here” written for International Women’s Day. Perhaps thematically it may not have worked, but the feminist anthem was inspired in part by their mother’s message to Johanna and Klara, as young girls, that they could become whoever or whatever they wanted. The balance of inspiration came about from their anger at violence from men against women, from the little comments and disparaging jokes to the outright egregious victimizing attacks. The song, though not included on the new LP, shows First Aid Kit’s true range as a music group, and I hope to hear more from the Soderberg sisters in that vein.